We got our first wedding gift! At first I didn’t realize what it was. It was a box delivered from Amazon and we have Amazon Prime (and use it way too much to order things) so I thought it was just another package. Then I saw it was addressed to me and ran through the list in my head of things I’d ordered…Wait, I didn’t order anything this big…Then I saw it said “gift” on the box. Michael and I debated for awhile on whether to open it or wait. The wedding is a few months away but why would we just have a box sitting in our living room for a few months? We decided to open it. Woohoo!! A nice, fancy new crockpot! I have an old crockpot that works fine, but I’ve always wished it was one that had a timer. I cannot wait to use this baby! Bella was investigating everything, sniffing and nudging it. 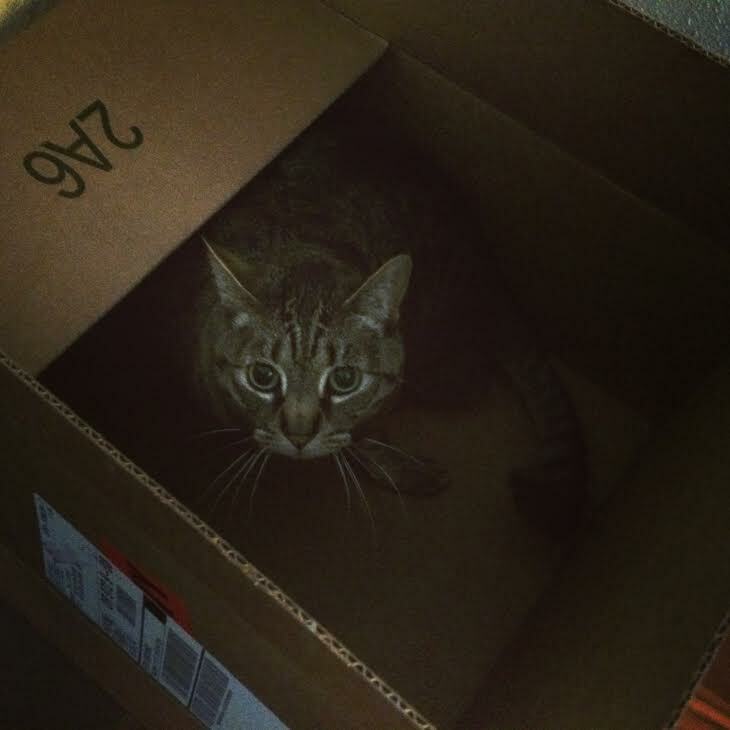 Fat Kitty was more excited about the box it came in. He immediately jumped inside and started playing with the box. I love these goofy fur babies. I decided to test it out. I found this recipe awhile ago and wanted to try it but the weather changed and it was really warm and sunny out and the idea of soup didn’t appeal to me. Which was weird because I typically eat soup year round! Unfortunately the recipe wasn’t great and definitely wasn’t photogenic. So trying a different one! I LOVE the new crockpot. It’s so shiny and pretty. 🙂 I like that it’s oval shaped; that makes it easier to store in the kitchen cabinet. The timer part worked great. I set the timer for 7.5 hours. After that time is up, it goes into “Warming Mode” for up to 4 hours. I love this feature! 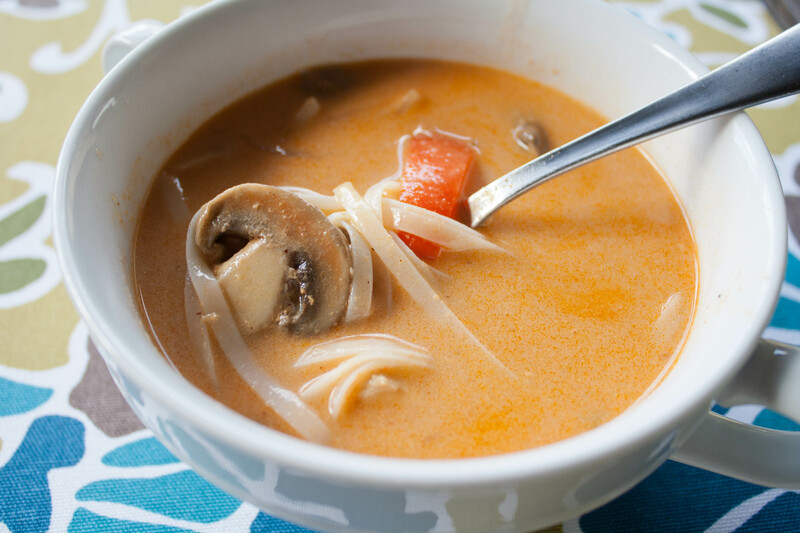 Mix the curry paste, coconut milk, chicken stock, fish sauce, brown sugar and peanut butter in a 4-1/2 to 6-quart slow-cooker bowl. 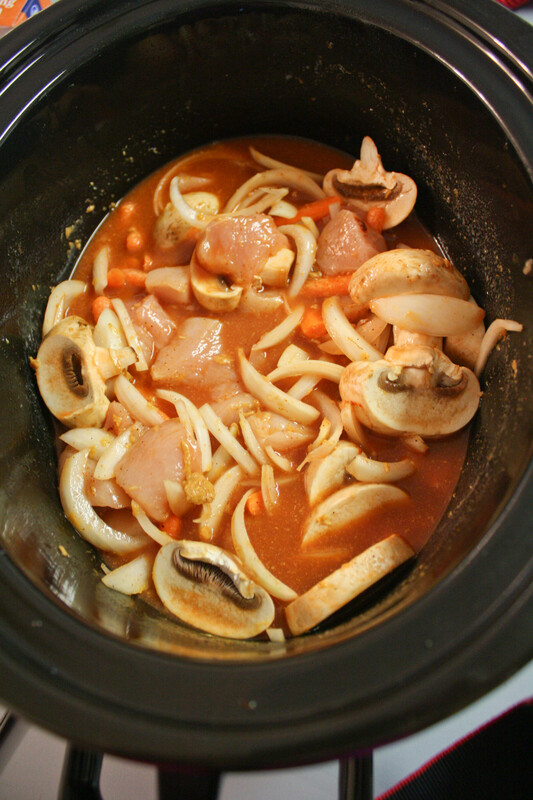 Place the chicken breast, red bell pepper, onion and ginger in the slow cooker, cover and cook on high for 4 hours. Add in the peas and cook for 1/2 hour longer. Stir in lime juice and serve with cilantro and white rice. If you use light coconut milk you save about 200 calories. If you use the regular the calories for this dish is closer to 600 per serving. I added some chopped carrots and also some mushrooms (for Michael). I like how versatile these types of dishes are. You can add pretty much any vegetable you want and you can easily make this vegetarian. I’m also glad I read through the comments on the blog post. Lots of readers had tested the recipe and had some alterations.The big one was not adding the coconut milk at the beginning. Lots of readers had curdled soup. Gross! So I followed their instructions and added the coconut milk about 30 minutes before it was going to be done. Also, I’ve never cooked chicken on high before and most crockpot chicken recipes cook around 4-6 hours tops on low so I put my crockpot on low and kept checking on it to make sure it was ok. I skipped the frozen peas and didn’t have cilantro but that’s ok. I don’t think cilantro makes or breaks a recipe (except maybe salsa). I added the coconut milk around 30 minutes before it was going to be ready. It didn’t curdle or separate like some of the readers complained about. I debated about adding the second can because the first added a lot of liquid and it seemed “soupy” enough but it had some kick to it so I figured the second can couldn’t hurt. While the soup was finishing up, I soaked some Pad Thai noodles in warm water per the instructions. I know this recipe said to serve with rice but I didn’t really feel like rice. I wanted more of a soup and the pad thai noodles are rice noodles and gluten free so that worked perfectly! Once the noodles were properly soaked and softened, I added them to the crockpot, added the lime juice, stirred it up and dinner was served! The flavors were so rich! I liked spice that it had. Because I added that second can of coconut milk, the original heat was diluted so I was going to add just a bit of sriracha sauce but I didn’t need to. It was still pretty spicy–but in a pleasant way, not super spicy. I let Michael have all my mushrooms. 🙂 He said the mushrooms were fantastic in the dish. I’ll take his word for it. One thing I didn’t like–the red peppers were annihilated. I added them around the 2 hour mark thinking that would be okay (the recipe called for them to be added at the beginning). They were too soft and squishy. Next time I would make this and add the red peppers when I add the coconut milk so they stay a little more firm. Also, the chicken was great so cooking it on low for 4 hours was the right move! I got 7 servings out of this recipe and I had plenty for lunches. All in all I loved this recipe and would definitely make it again. I think it’s a delicious recipe, it’s low in calories, and I can see it being a hit at a dinner party. This will definitely become a regular in this house! Yay! I’m so glad you used it already. That looks delicious. I’m totally having timer envy, but I just can’t trade up quite yet. 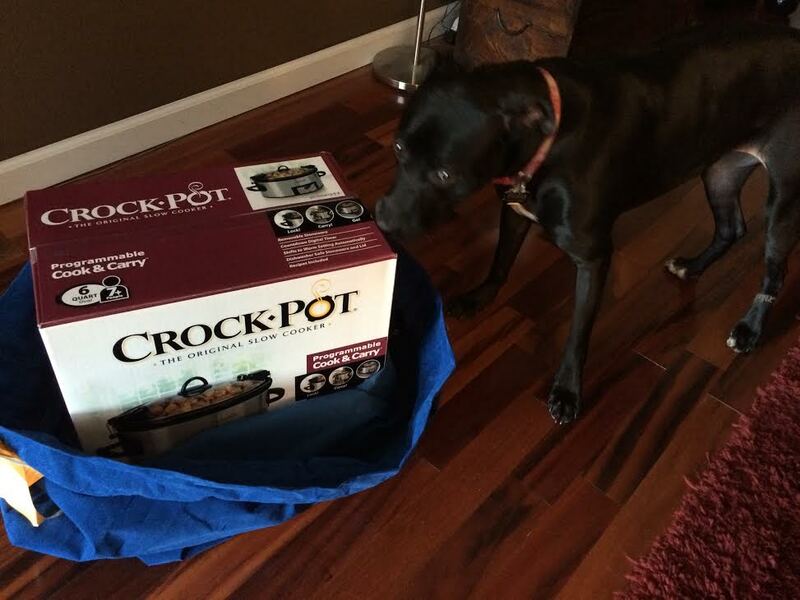 A crock pot with a timer! Guess mine is definitely old school then but I wouldn’t trade it for anything. 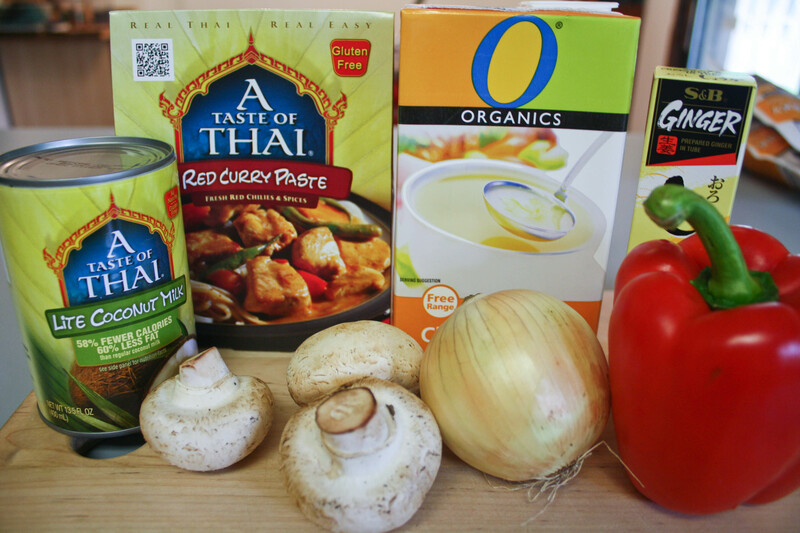 The flavours you get from a crock pot meal are amazing and I especially enjoy Thai food. I’ll be trying this recipe out. Thank you for the extra helpful hints about the coconut milk. Let me know how you like it. It’s even better as leftovers, FYI. 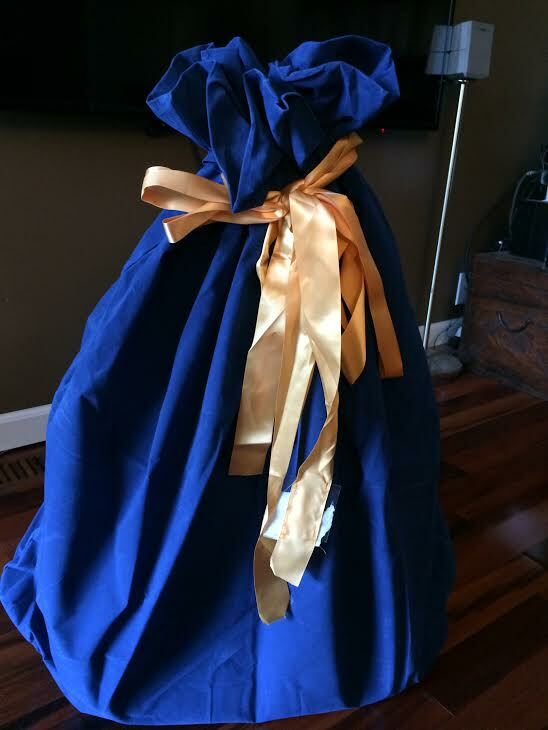 YAY wedding presents! I’m very jealous of your timer crockpot. My favourite wedding present was my food processer, even though I’ve only used it once. It’s just a pain to clean. We are moving at the end of the month to a house that we have bought and it has a dishwasher, so I’ll be using it more. Can’t wait to make lots of dips and sauces. Very nice! I got an immersion blender for Christmas from Michael’s mom and I still haven’t used it. I need to. I had a whole list of things I wanted to make with it! 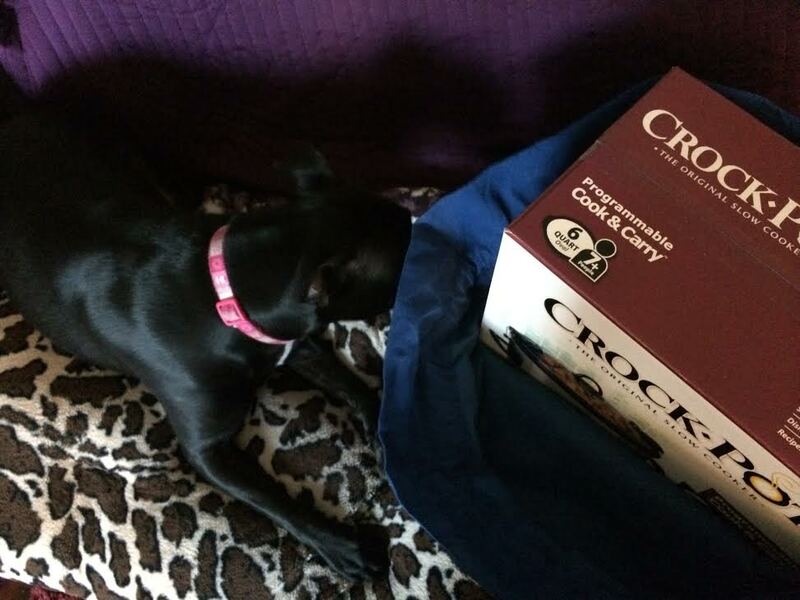 Hooray for a new crock pot with a timer – I love the timer feature on mine!!! And, that soup looks tasty! It was a really good soup!